So today was East Kingdom coronation in our second home, Barony of Concordia of the Snows. Their much-loved Majesties Brennan and Caoilfhionn returned to the throne, and there was much rejoicing. It was a beautiful day. My teacher, Mistress Zsof, had come out from the Midrealm to celebrate our coronation with us (or so I thought). 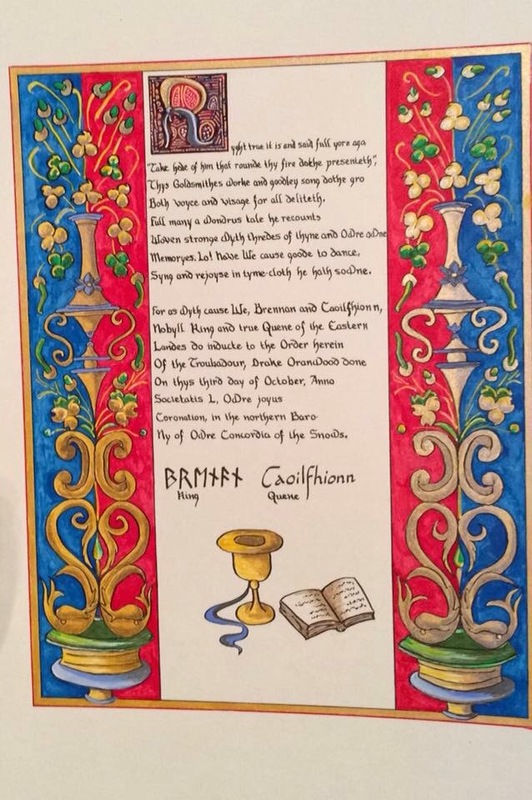 There was a delicious day board, and at their Majesties’ first court, I got to see my friend Magnus Hvalmagi receive a well-earned writ of elevation to the Order of the Laurel. The Order of the Troubadour is an East Kingdom award for singers and musicians, and it’s something I have dreamt of earning for some time now. To have received it from Brennan and Caoilfhionn on their first day back on the thone, and surrounded by my beloved Concordian friends, was a privilege beyond anything I dared hope. Likewise having the Order assemble to welcome me in court, which is rarely done, since the Troubadour isn’t a polling order (meaning the order doesn’t vote on who will be admitted). I am still flooded with delight and gratitude at everyone who went to the time and effort that made this moment so memorable for me. Thank you all. This entry was posted in bardic, SCA by Drake Oranwood. Bookmark the permalink.